It was prior to the start of the University of Nebraska-Omaha’s 2013-14 hockey season when Thompson, goaltender for the Mavericks, was first introduced to the team’s new forward who was about to embark on his freshman campaign. Mike Kemp, who had a 12-year tenure as the Nebraska-Omaha head coach, said the very same. For Thompson, watching Guentzel, who would captain the Mavericks, do the same to other U.S. collegiate competition was far more gratifying. In all, Guentzel, who was drafted 77th overall by Pittsburgh in 2013, recorded 40 goals 119 points in 108 NCAA games and earned NCHC All-Rookie Team honours. He was called up by the Penguins in November 2016 and scored twice in his NHL debut against the New York Rangers, including a goal on his first shot and first shift. By mid-January, Guentzel was a regular in the lineup. He finished the campaign with 33 points (16 goals, 17 assists) in 40 games. That impressive performance would pale in comparison to his post-season exploits. 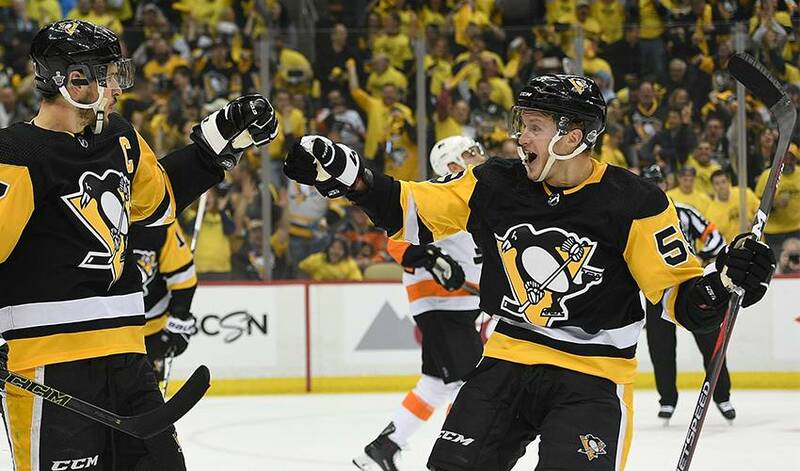 Guentzel led all scorers in the Stanley Cup Playoffs with 13 goals and tied the playoff record for points by a rookie with 21, matching Dino Ciccarelli of the Minnesota North Stars in 1981 and Ville Leino of the Philadelphia Flyers in 2010. According to the Elias Sports Bureau, Guentzel became the second rookie in NHL history to have a hat trick and score an overtime goal in the same playoff game when he helped Pittsburgh rally for a 5-4 victory against Columbus in Game 3 of the Eastern Conference First Round (Gerry Plamondon was the other, with the Montreal Canadiens in 1949). He was also the first Pittsburgh rookie to net three goals in a playoff contest. His impact didn’t end there. Guentzel scored the winning goal in Games 1 and 2 of the Stanley Cup Final against Nashville, as Pittsburgh went on to become the first repeat NHL champions in 19 years. Guentzel was also a person that didn’t forget the people and the place that helped pave his way to an NHL career. That was obvious this January when the university had a Jake Guentzel Night at Baxter Arena. And Thompson, who still maintains a close friendship with Guentzel, admits it’s pretty cool to see his former teammate making his mark with and against the best hockey players in the world. That scrawny blonde kid with the big smile has done okay for himself. “He sure has,” said Thompson.